Feeling weak in the knees is only good in the romantic sense. In the physical sense, it’s a painfully life-limiting problem, especially when you undergo an injury that requires surgery, whether it be a repair to a torn ligament or a knee replacement, it’s a long and time-consuming road to recovery that can at many times feel like taking on a second job. No more wanderlusting hikes through unexplored places. But, there’s an upside to that second-job that usually ends up making your knees and body stronger than it was before injury. Raise the roof! 6 weeks post surgery are in a straight leg brace. Next 3 weeks I moved from using a cane to walking peg leg in my brace while working slightly on regaining my range of motion. daily physical therapy exercises continuing to work on flexion and range of motion, balance, and regaining leg strength through tons of cycling, leg lifts, leg presses, squats, etc. I’ve spoken to many who did not get their meniscus repaired (only their ACL) and they have come back to full recovery in around 6 months. In that case, depending on how much time and energy you can devote to your rehab process and how old you are, you can fully recover anywhere between 6 months to a year. Obviously the younger your joints are and the more time you have to commit to your rehab, the faster and smoother this process will go. I’m 26 years old with a full time job, so my body hasn’t turned on me yet, but finding the time for rehab definitely required some changes in my routine — earlier mornings, later nights and a lot of hard work. Just like any other dedicated workout program, rehabbing actually starts to become addicting once you begin to see the positive effects of progress. My knee felt as stiff as a board sometimes, and my physical therapy appointments were painful ones, but through regular stretching, I got my full range of motion back incredibly fast. Now it’s all about getting the muscle back and regaining the strength to get back to sports. 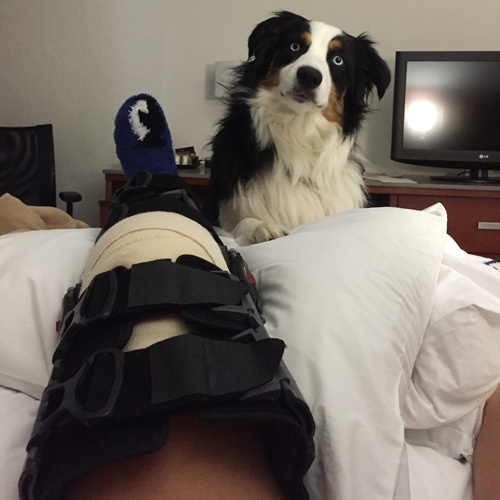 Before I went through this procedure, I was pretty active, ate fairly healthy, and what standards consider a healthy human, but I always had a bit of knee problems from skiing and running. None of it was entirely debilitating so I ignored the pain. 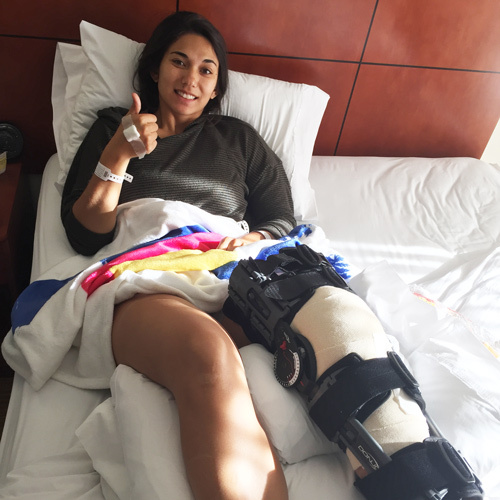 After going through the surgery, I’ve learned almost everything there is to know about the anatomy of the knee, how to keep it strong and supported, which stretches aid pain in certain areas and how much daily work the body needs to stay at its peak levels. Now I plan on going back into skiing and other actions sports even stronger than I was before I tore my ACL both physically and mentally. Before my rehab process, it was easy for me to become lackadaisical about my exercise routine and my eating habits. If I had a good excuse to skip the gym I’d do it, and the terms for “good excuse” were typically very broad. Sometimes as broad as just saying “I’d rather catch up on Orange Is The New Black and maybe finally start Breaking Bad”. Though, now if I skip my rehab, I risk far too much: my knee never being as strong as it once was, and never getting to get back to skiing or surfing or hiking without severe limitations. Since the surgery I’ve also been able to easily quit smoking. Yes, I write for a health website and was once considered a smoker. But, because I’ve had to discipline my habits and body, I can easily avoid old triggers that used to make me crave the old habit. When you live in a city like Los Angeles, it can be very easy to get caught up in the whirlwind that this city can sometimes be. There’s creatives everywhere, good art and entertainment are always knocking on your door, much of it for free. The more people you get to know, the more things there are to do. Even if you don’t live in Los Angeles, our fast-paced world has become much more demanding of our time and energy. Meditation classes have begun to sprout up because people are moving so fast, they’ve forgotten how to stop and take a breather, sit in their thoughts for longer than 5 minutes and let life marinate into you. When you become limited physically for an extended period of time, you become a little bit more grateful for those times you had a fully healthy and functioning body and you want to take better care of it. And, you become a little bit more connected to yourself, rather than everything happening around you. And, even though you’re limited temporarily and the mean time can be a tough and physically painful one, you still know it’s just temporary.